Peakles and I share a simple memory game that celebrates all things to do with Sloths! Peakles and I are fascinated by these creatures. Of the six different species of sloth, one is classed as critically endangered and one is vulnerable. The rainforests of Central and South America are the sloths natural habitat and as this decreases through deforestation, the sloths have fewer areas to live in. Because of this, plus the fact sloths are both fascinating and very cute, we have decided to make a sloth game for Peakles to play with! We are also going to Adopt a Sloth on the 20th October which is International Sloth Day! We found out about this fundraising scheme through World Wildlife Fund – Sloths and you can find out more by clicking through on the link too! 8 different sloth images – print 2 matching images adjusted to approximately the size of an ordinary playing card. Trim the pictures to the size of the playing cards. Take the king of hearts and the king of diamonds and stick the same sloth image over the top of the king of hearts and diamonds. The card should now have a sloth on it rather than a king! Repeat this with the rest of the picture cards and the ace cards too. Take all of the sloth cards and shuffle them. Lay all the cards face down. Each person takes a turn to turn over two cards. If they match then the person wins those cards. If the do not match then the cards are turned back over and the next person takes a turn to try and find a matching pair from the face down cards. The winner is the person who has the most cards! This is such a simple game for kids to play and it can be played in a group on your own too! This is card game is similar to snap. Add the sloth cards to the rest of the pack and shuffle well. Deal the cards out between all the players. Each player takes a turn to play a card. This card is turned over and placed it in the centre of the table. Everyone repeats this until someone turns over a sloth card and the first person to shout “SLOTH!” wins that round. They add all the cards to theirs and then they start another round. Once a person has used up all their cards they are out and cannot shout “SLOTH!” The winner is the last person who still has cards left! 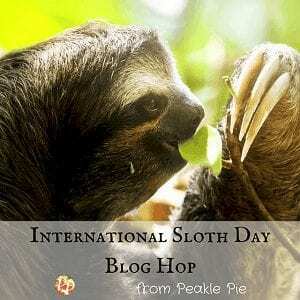 We are delighted to be joining some other great bloggers this month to celebrate International Sloth Day! We have come together to find out more about sloths through different games and activities. Just click on the highlighted links below to find out what everyone else has posted for International Sloth Day! Your posts are great! This looks like a lot of fun!